In her painting Craggy and wind – hewn, Savanhdary Vongpoothorn has created a luminous work that is detailed and layered in both intent and character. Vongpoothorn has used a number of novel techniques in this work, the most noted of these being the piercing of the canvas from behind to form a grid pattern. Paint is then applied so that it “bleeds” through the punctures to blot the surface to form a subtle variegated background onto which other layers are superimposed. Being an abstract work it takes on the intellectual aspect of contemporary art and yet has cultural references drawing on the styles of Lao textiles, Euramerican high modernism and Australian landscape painting. The work is a demanding painting but it is a painting that responds to the viewer. The more you give to it, the more it gives to you. Savanhdary Vongpoothorn was born in Laos in 1971. She arrived in Australia in 1979. She studied at the University of Western Sydney and received a Bachelor of Arts (Visual) 1990-1992; University of NSW COFA Masters of Arts (Visual) 1993. Various solo and group exhibitions 1992-2000, including Spirit and Place MCA 1995, Moet and Chandon 1998, Various awards including VACB Grant 1997. 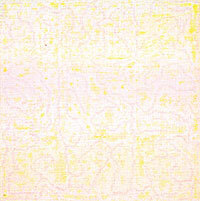 Represented in QAG, various regional and university collections, Artbank, Macquarie Bank and Allen, Allen and Hemsley.